It's the coat of the moment, so when I spotted this sateen puffer in the New Look sale for a mere £14, it had to be mine. As this coat trend shows no sign of waning, I felt pretty smug strolling past an array of new season puffers whilst popping in store to collect my online steal. 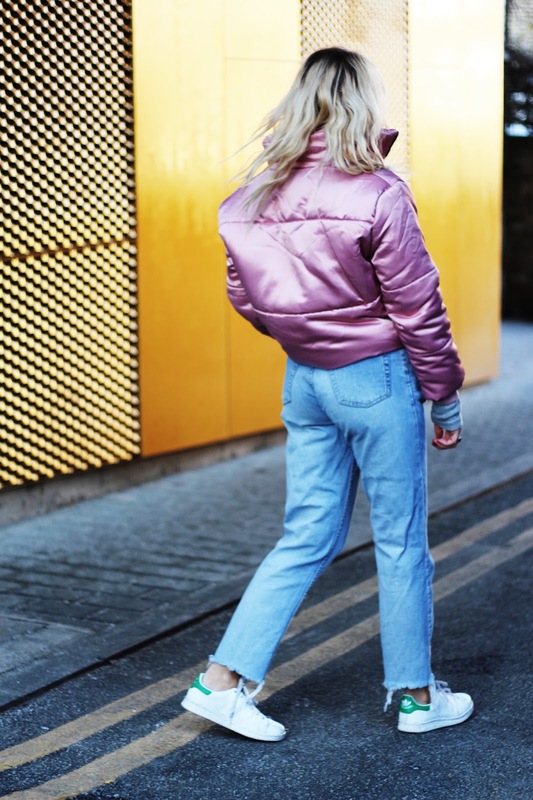 Pink, quilted and cropped, yet still warm enough to layer up for this Arctic blast we're having of late - I've never felt so winning at life. Its first outing was a local mooch. Basically, popping to Tescos, hitting the Hackney chazza shops and grabbing a coffee, I know, my life is so glam, right? Styled with mom jeans, Stan Smiths and a grey jumper (because I think pink and grey get along swimmingly) it was definitely a 'bloggable' combo. I say 'bloggable' because most of my Saturday strolling attire consists of old gym gear that once upon a time I used to wear to the gym, and now, I seem to only wear to MacDonalds or Tescos. Maybe not winning at life in the health department, eh? Not bad all for £14 - love a bargain especially when it looks this good! Really love your outfit especially your pinky jacket!